Growing up with an English mum, a Scots dad and a gran who spoke with a Shropshire accent but attended the United Free Church, I was bound to be confused as a boy. It's surprising how normal an adult I've turned out to be. One lasting effect was that the certainties of the Catholic church have always appealed, though they seem to demand great faith combined with suspension of disbelief. So when Susan starts explaining over a beer what it's like to be a Catholic, I prick up my ears. "We used to have to go to confession," she says. "I was a good girl so I'd make stuff up. "I'd go 'Bless me Father for I have sinned it has been one week since my last confession.' And he'd go 'Yes my child carry on.' And I'd go 'I've been cheeky to my Mum three times'. And he'd give me two Hail Marys and an Our Father and I'd come out and say my prayers and that was it, done and dusted." The autumn light slanting through the window sheds little sunbursts from the rim of my glass. So I shift in my seat to see her eyes more clearly. You can learn lots from people's eyes. "Suppose you'd done worse stuff than cheek," I say. "Would you just get more prayers - is that how it worked?" "Yes, but it was a bit random," she says. "One time the monks came and took confession and I told Father Martin the usual stuff and he gave me a whole Rosary." Her widening eyes tell me how shocking this is. "That is so shocking," I say, sipping my beer. "What's a Rosary?" "I forgot you're an ignorant proddy," she says. "Buddhist please," I say. "Ignorant Buddhist." "Whatever," she says. 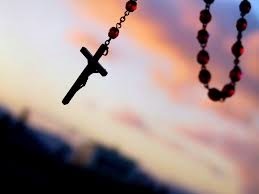 "The Rosary has dozens of prayers and takes half an hour to get through. The worst part of being a Catholic, though, was the poor souls in Purgatory. You'd to pray to get them into Heaven. I used to lie awake at night wondering if I'd stopped too soon and left one dangling half in and half out." I start to laugh then see she's serious. "That worried you?" I say. "It still worries me!" she says. "Forty years later." I pat her shoulder. "They'll be in by now," I say. "Someone will have given them a hand up, or a ladder. Relax." The tension at the corners of her eyes eases. "So anyway, Mary has a novena she's been saying every night for people with problems," she says. "It's a set of prayers in a wee book. She has this favourite she bought years ago and when she got it home found the pages were all out of order. So she calls it her Twisted Novena." I smile at the thought of Mary and her efforts to make things better for the people she loves, as well as those she doesn't. No question where she's headed when she leaves this world. "You're included since you got your diagnosis," Susan says, which gives me a wee warm glow. "But she's now got so many people to say prayers for, she can hardly get to bed at night. She talked to the priest and he told her to leave it to the Holy Spirit to figure out who to help first." I open my mouth and she puts her finger up. "No smart-arsed remarks about the Holy Spirit please," she says. "I was only going to ask how He decides," I say. "Probably tosses a coin. That's what I'd do." She shakes her head sadly. "You're going to the Big Bad Fire, son." "I know," I say. "The Wee Free minister told me that, many years ago, when he caught me smoking behind his church. Harsh, I'm sure you'll agree, but it taught me a valuable lesson." "I stopped going to church." *Wee scientific pleasantry there, so apologies to my non-physicist readers. You have no idea how hard this is, when half your followers are intellectuals, while the other half just want knob jokes. Nick Clegg has more or less the same problem.